Aamir Khan’s latest film “Dangal” is now Bollywood’s highest grossing movie of all time, breaking the record set by his previous release “PK” in 2014. “Dangal” pulled in around 3.45 billion rupees ($50 million) in net domestic revenue by Sunday, trade sources said, overtaking PK’s box office haul of 3.38 billion rupees ($49 million). The film, directed by Nitesh Tiwari, is based on real-life wrestler Mahavir Singh Phogat and his struggle to turn his daughters into world-class wrestlers. The film is still in cinemas and doesn’t face competition till January’s big release next week – Shah Rukh Khan’s “Raees”. Aamir Khan’s penchant for choosing stories that reflect Indian themes and a publicity blitzkrieg seems to have paid off. Three of the four top-grossing Hindi films of all time feature the 51-year-old actor in the lead, with only Salman Khan’s 2015 “Bajrangi Bhaijaan” breaking the monopoly. 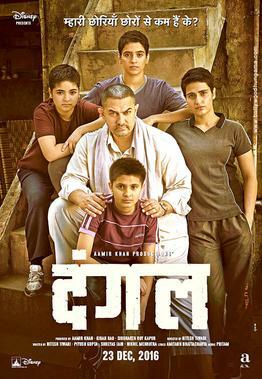 The critically acclaimed “Dangal” opened in cinemas on Dec. 23 and took in more than a billion rupees ($14 million) in domestic ticket sales in three days.